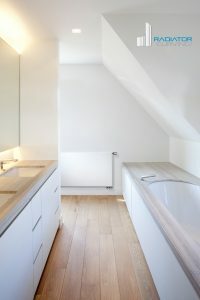 The Flat Panel Radiator is hugely popular at present particularly in London where its the Architects preferred choice when Designing or Renovating modern/contemporary homes. 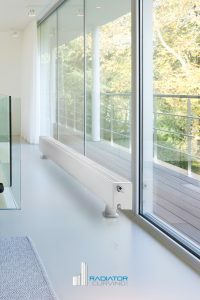 Our Flat Panel Radiator in our portfolio is called the Flatline & manufactured in Belgium by Designer Radiator Specialists, Vasco. This desirable model has a choice of Vertical, Horizontal & Low Level Radiator options. 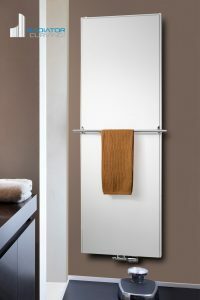 Manufactured from the very best mild steel, the fully welded 2mm front panel adds solidarity to its contemporary looks. See below the vast ranges of sizes available from stock & bespoke order. 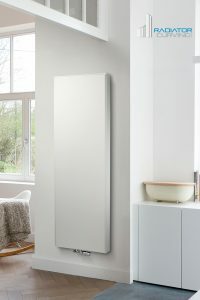 If your budget cant quite stretch to the best then the other choice of Flat Panel Radiator is the Planal by Ultraheat. These Radiators are very popular & the Distributor holds large, extensive stocks! All available in 3-5 Working Days. The product has a stuck on Flat Steel Front & has 6 tapping's enabling various connection points for that Contemporary Slimline Finish. 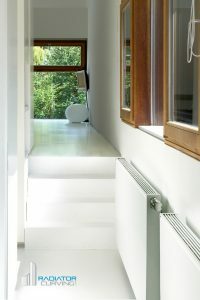 Simular to the T21 Vertical Radiator but with greater depth which gives Higher Output, the Vasco Flat V-Line T22 is a London Architects favoured product for that awkward, hard to Heat large open area such as a Kitchen Diner with Bi-Fold Doors. heat supply with futuristic technology and stylish appearance. 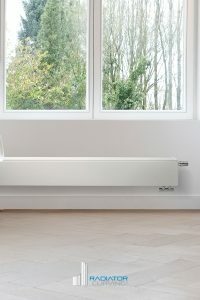 Its synthesis of simplicity, efficiency and aesthetics, enhanced by the smart, fixed middle connection, allows this designer panel radiator to blend harmoniously into any living and working space. It has a specially designed towel rail for bathroom and kitchen. The heat output of the Flat-V-Line is huge, up to 3251 watts! It has six connections and can be connected to the 2×3/4” (eurocone) middle connection at the bottom or the 18-socket 2×1/2”. The uppermost connections are for the placement of the air vent. Each Flat-V-Line is available solely in a high-quality white textured paint (S600). panel, side panels and designer line grid. This combines a superior heat supply with futuristic technology and stylish appearance. Its eight connections makes it universally connectable regardless of the type and the length. It fits beautifully into large windows because of its low height. It is possible to install the Flat-Plinth-Line on the wall or on the floor. The unique, stylish design and quality finish of the FlatLine immediately draws attention. This unique panel radiator with an elegant line grid is finished in high-quality texturedpaint S600. A FlatLine proudly bears the Vasco stamp, the quality mark for radiators. A FlatLine can be supplied with a designer thermostat. A chrome lower block is also an option. For your convenience, you have a choice between two different towel rails. No need to rip out old fixtures! The FlatLine makes this a thing of the past. FlatLines are universally connectable thanks to eight different types of connections. A FlatLine can be connected anywhere regardless of the type and length. This is because the unique middle connection makes it very easy to connect up a FlatLine with the greatest precision. And, for all types, the distance between the wall and the middle connection is fixed (66mm). The lockable console makes installation easy and safe.